One of my favorite times of year – things are shifting! The patterns are changing all over, some more subtle than others. I’m hearing and seeing new birds as they pass through on their way south, and the resident birds and animals are starting to shift their patterns as well. 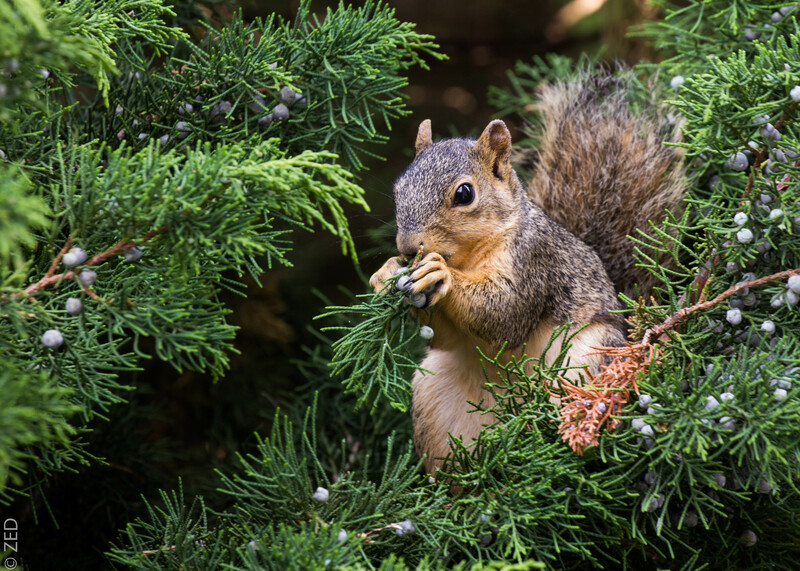 Fox squirrels seem to be everywhere I turn, busy running and gathering. The mornings are sunny and there’s a slight crispness in the air starting to build, almost a bit electric. The light has a softness to it, despite the heat that today was above 90 deg F in the immediate Bay Area. Not easy weather, to, um, weather, for a landscape already parched with drought. Even the winds have gone elsewhere, allowing a degree of peace to settle over the stressed landscape. Sitting still I can hear bugs crawling through the leaves, and the occasional falling leaf even makes a sound as it falls through the dry undergrowth to join its crunchy fallen partners on the ground, who are now having the chance to use their voice – while not drowned out by Wind – to announce Coyote or Deer moving nearby. So fun! Things are incredibly dry here – you can read about it all over in the news, worst drought in over a century and possibly since settlers have been keeping records here. But, to really understand it all one needs to do is to go out to FEEL it and see it yourself. Springs and creeks are dry. The evergreen trees, such as the live oaks, are even losing some of their leaves (which I understand is a drought response tactic to minimize moisture loss). Many of the under story leaves and any leaves not at the top of the tree or on the exteriors have fallen away, to varying degrees, depending on the location of the trees. I’m able to see wood rat nests high up in canopies that were very difficult to see before. Even the California buckeyes, who are some of the first obvious beacons of autumn since they lose their leaves before most other deciduous trees, have been bare for weeks in some locations. Redwoods and cedars are looking wilted and brown. Even the non-native eucalytpus trees look scraggly. A fine dust encapsulates many of the leaves, and the hillsides are painted brown with wilted grasses. I’m happy to report that I’m doing my best to help conserve water – infrequent showers, I don’t clean my bathroom, and I occasionally drink distilled beverages instead of water (the distillation process releases water back into the atmosphere – that’s science). Little gestures, they add up. One benefit of the trees being thinned out (if one wants to be a “glass half-full type of person” – though a water analogy is probably not appropriate here), is that there aren’t many places for a large bird to hide. Until about two weeks ago, I was seeing with some regularity a family of Cooper’s hawks hanging in one particular area. I thought it was interesting that they were all still together this late in the season – the migration has begun for many birds already. 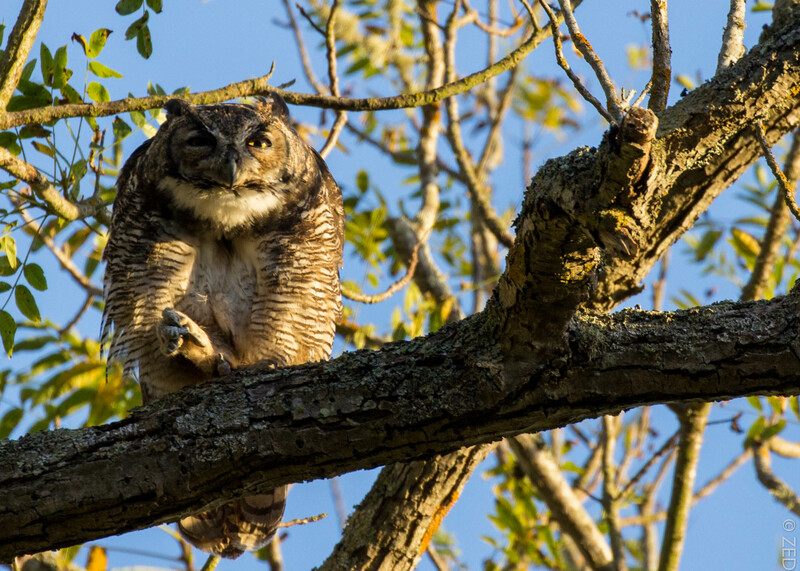 The first day that I saw them, about three weeks ago, two juveniles suddenly appeared indiscreetly in the branches 20 feet above my head, crashing around either chasing each other or chasing potential prey (a bird). 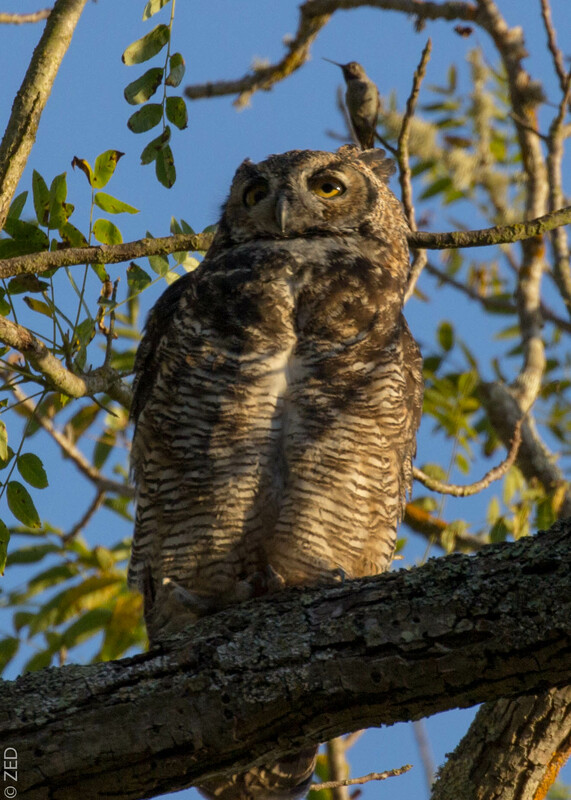 They finally settled into the interior live oaks next to me, and soon were joined by an adult. A few days later, I saw the same trio in a nearby tree near sunset. I don’t know much about these hawks’ chick-rearing patterns, but I couldn’t help but wonder if these hawks stay around parents longer than some other raptor species to learn from them. It could be a late nest, but it seems extremely late if so. Cooper’s hawks (and sharp-shinned hawks, their mini look-alikes) often tandem hunt in pairs, one flushing birds as the other wake hunts and catches them. Could it be that this is a learned behavior? Of course I must mention the owls. This photo was interesting, I wish I could have gotten both birds in focus – do you see it? 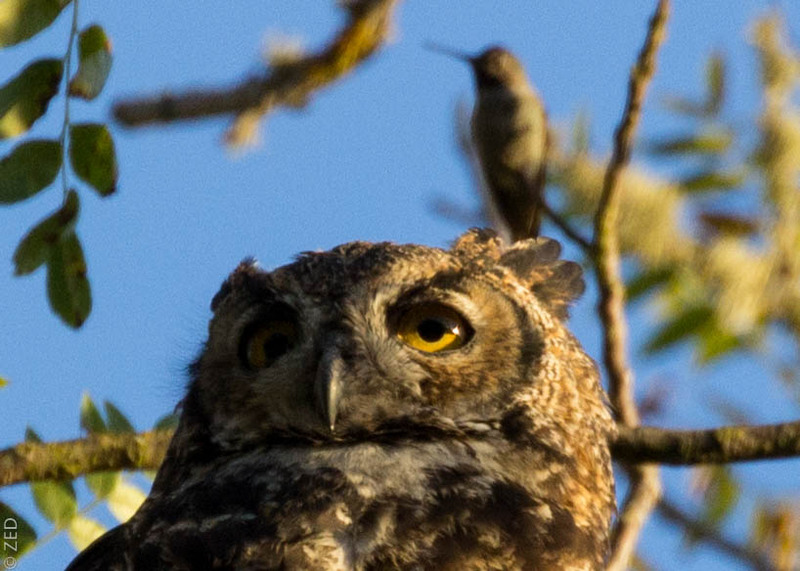 Hummingbird came in to scold the owl! It hung around for a minute or so, just behind the owl. The next night, I wandered without my camera but was excited to get to spend some time with the female owl again. After she flew off to look for breakfast, I followed her out a path under the fading light of the sun that had already disappeared behind the mountains to the west. As I was about to crest a hill and descend into a small valley, another raptor caught my eye – juvenile cooper’s hawk! Likely one of the juveniles from the trio described earlier, though I didn’t see any of the others. 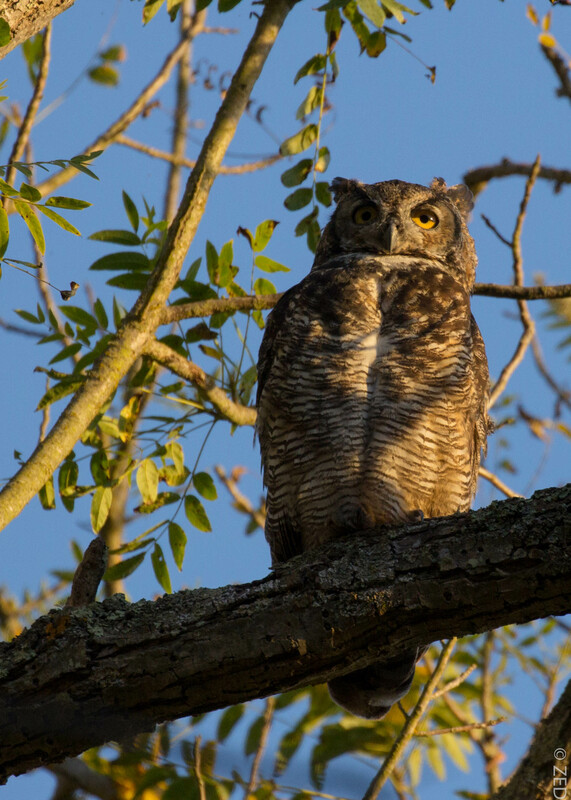 This young one did some flights through some small oaks attempting to scare up some birds from their night perch, then having failed to get any takers, it landed on an old wood fence post and began to vocalize repeatedly – in what felt to me like frustration and irritation. It’s not easy being a young raptor (many species up to 70% don’t survive their first year). The young one made another attempt, alighted on a high tree nearby, then took off after three flying birds (who were not keen on the company). As it finally flew off, I heard some coyotes howling just beneath me! I silently walked in that direction – then … crunching! Coming my way! I froze, and sure enough one, then another, then another appeared in the fading light. They didn’t seem to see me (or maybe they just didn’t care), once they all were in line together they trotted with purpose to the south to start their nightly excursions. Last sounds I heard were the crickets calling as I walked through the “portal,” and the sound of cars from the highway took over the soothing sounds of nature. I’m so grateful for the parks that we have here in the Bay Area, like many of the creatures around, I wouldn’t survive here without them. This entry was posted on September 8, 2015 by feralzach. 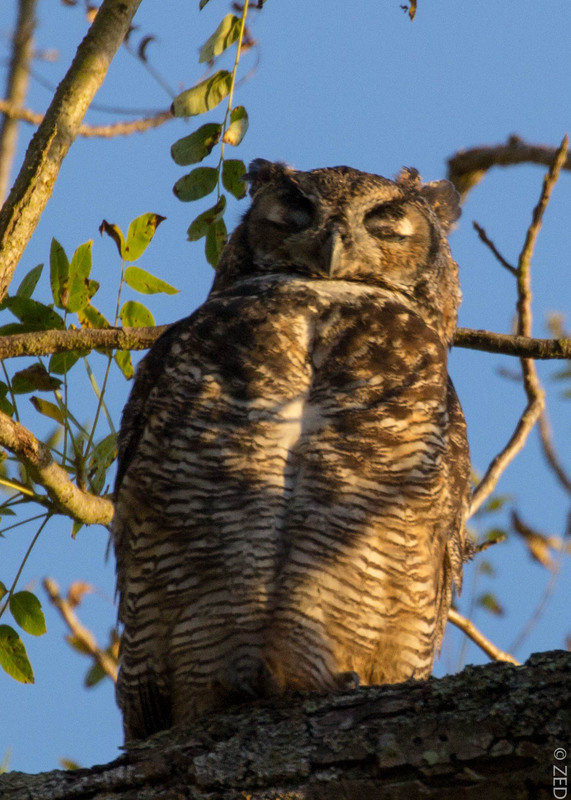 It was filed under Uncategorized and was tagged with autumn, Bubo virginianus, california, Canis latrans, cooper's hawk, coyote, drought, east bay regional parks, great-horned owl, juvenile.